Frank William Zombo III (born March 5, 1987) is an American football linebacker for the Kansas City Chiefs of the National Football League. He was signed by the Green Bay Packers as an undrafted free agent in 2010 and later won Super Bowl XLV with them over the Pittsburgh Steelers. He played college football at Central Michigan. In Super Bowl XLV, Zombo recorded a sack as well as 5 tackles (2 for a loss), as Green Bay beat Pittsburgh 31-25 to bring the Lombardi trophy back to Green Bay for the first time in 14 years. On April 3, 2013 Zombo signed with the Kansas City Chiefs. He signed for another year on March 10, 2014. 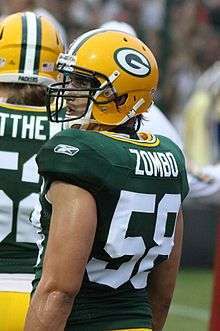 ↑ "Green Bay Packers activate LB Zombo from PUP list". Yahoo! Sports. 2012-11-03. Retrieved 2012-11-03. ↑ Thorman, Joel. "Frank Zombo will return to Kansas City Chiefs, according to report". Arrowheadpride.com. Retrieved 10 March 2014.